This drawer was ... impressive. Did you also buy an old fixer-upper with cupboards and drawers that haven’t been cleaned in decades? I started the cleaning by using a rag and soapy water. Then I used my trusty scrub brush. I scrubbed and scrubbed and scrubbed. 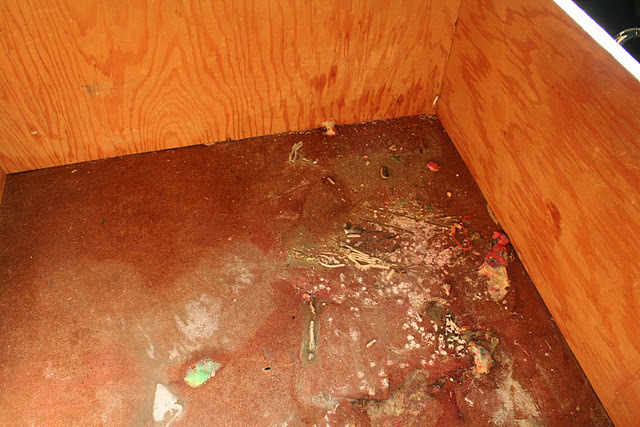 But the grime was like a coating of wax, that just worked further into the grain of the wood. Desperate, I looked around the house at our tools. 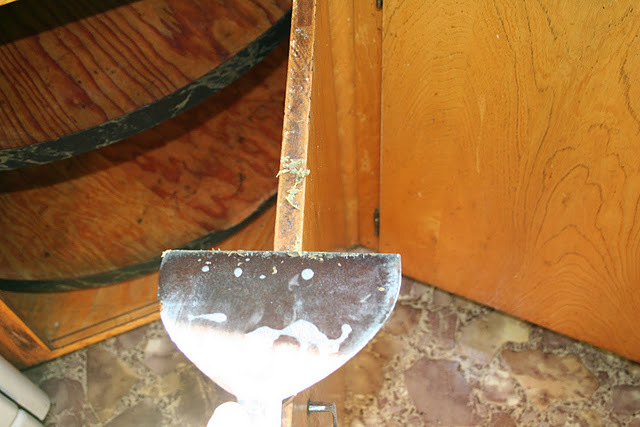 Scraping the top edge of the cupboard door. Spread warm soapy water on the cupboard surface. Use a paper towel to gather the gunk. Scrub with a rag and more soapy water. Repeat until you’re unable to scrape much gunk. Wash with a hot rag. Rinse with bleach water and wipe dry. Yeah, don’t bother ruining your good scrub brush. 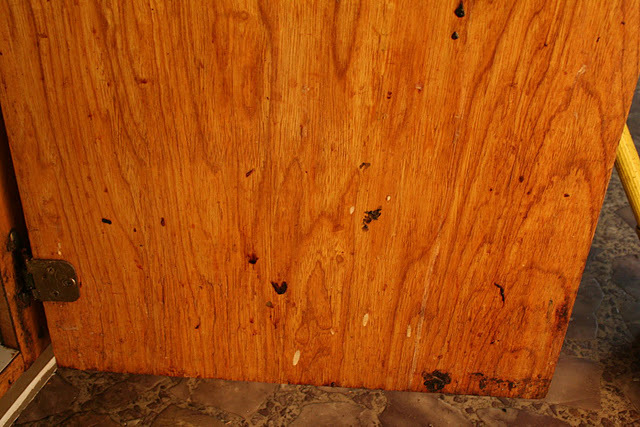 After it dries, you can lightly sand any plywood that started to splinter from vigorous scraping. The biggest challenge was the spilled food behind the big lazy susan. I climbed in there as best I could. This took all day (I took the day off of work to do this – I needed to know that the kitchen was clean), but now I’m not afraid to put our dishes and food in the kitchen.